HubSpot is one of the leading sales and inbound marketing tools available in the market today. It has proved itself and continues to generate customers and leads in a hassle-free manner. According to a recent study done by MIT, companies using HubSpot have seen three times more visitors on their website; five times more leads, and about 70% have seen a boost in their revenue. However, the numbers listed above come with a caveat. You can expect similar or better results provided you know how to effectively use the tools provided by HubSpot. You are definitely missing out on generating leads, conversion and revenue if you end up making mistakes that HubSpot points out as a clear no-no. 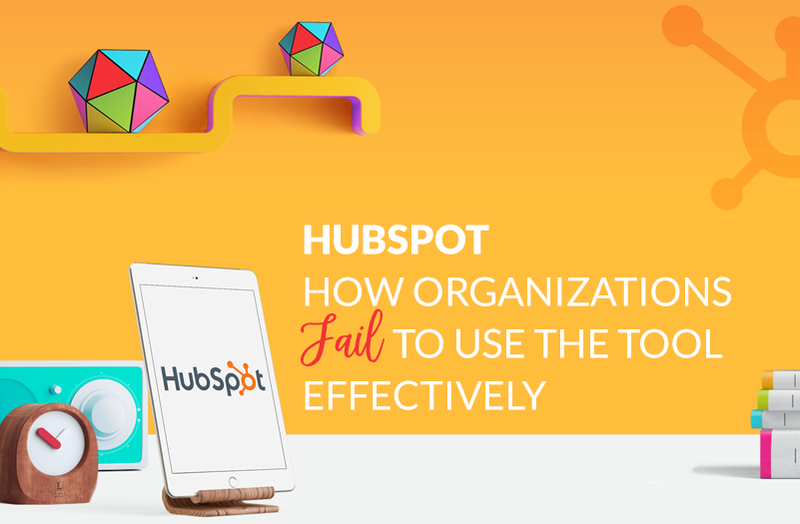 Here are eight important things that you might want to take a look at, for they could be the reasons why HubSpot is not working for your organization the way you intended it to. 1. The absence of a clear Sales Funnel – A Sales funnel or revenue funnel is a well-defined step of processes required to capture leads through conversion. Most organizations fail to clearly define how their sales funnel should operate. For example, a captured lead on a landing page could directly be asked to make a purchase instead of offering information about eradicating his pain points. A typical sales funnel has the following phases so that it is effective in its function – Awareness, Interest, Evaluation, Decision, Purchase, Re-evaluation and Re-purchase. Make sure your sales funnel is designed to help your leads in each of these phases. 2. Irresponsive website – Many organizations fail to identify that a majority of their leads could be captured from mobile devices. With more and more internet users going mobile, it is important to make your website mobile responsive. Mobile responsive in this context means that your website automatically resizes itself to fit any mobile devices, more or less like a mobile application. User experience is one of the important factors affecting lead capture and conversion. Spend some time and effort to make your website responsive to mobile devices and see the difference. 3. Misplaced or wrong call to action/s – A call to action (CTA) is a link on your landing page or web page that elicits a response from your visitor. Although your website might attract visitors, if your leads are comparatively low in number, make sure your messaging and CTAs are good enough for your visitors to leave their information with you. 4. Improper uses of landing pages– Landing or Squeeze pages are external to your website. The primary objective to have them in your sales funnel is to provide only the required information that your visitor seeks. Many organizations land their visitors on either the Home page or About us page. This is a clear no-no since you are distracting them and making it easier for them to leave your website. If your goal is to only capture information, making them land on a squeeze page or a landing page is a must. 5. Using email lists that are not yours– If you are using external email lists that are not yours, you are committing a big mistake. Imported email lists have least click-through rates and highest bounce or spam rates. By using such lists, you are surely downgrading your brand name. Instead, have a sound sales funnel and nurture leads that come through it. Communication with them becomes simpler and effective, while conversions are sure to be much better. 6. Improper personas – Persona tool in HubSpot helps you segment your audience appropriately. One reason responses from your leads could be poor is because you have not set the Persona correctly. Wrong messaging to right people can harm your brand and sales immensely. 7. Lack of complementing content – In any sales funnel, it is important to give your visitors the right content. If your landing page or a blog page doesn’t have complementing content to portray how you can help your visitors, they are bound to become cold leads in your sales funnel. At every stage of your sales funnel, make sure you are imparting the right content and messaging to the right audience. 8. Improper tracking – Tracking is key to succeeding in the digital space. If you do not know what your campaign numbers are, your time, effort and money are futile. You should know where your visitors are coming from, what they do on your landing page or website, what is your cost per lead acquisition is, if you are deviating from your objective of revenue generation with least costs, and more. Track everything that can be tracked from HubSpot and you will be thankful later. HubSpot works best when it is used correctly. When the tool offers a wide variety of features, utilize them the way they are intended to be used. Each of these features comes with a comprehensive set of tutorials, go through them and implement them step-by-step in your campaigns. Revisit the entire HubSpot tool again before going live again.